The Marine 31 Spray Polishing Pad Care Combo is a money-saving combo designed to maximize the life of your foam, wool and microfiber pads. 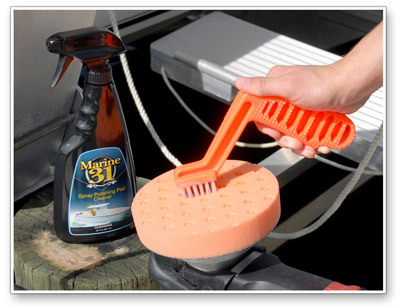 With the included Marine 31 pad care products and the Foam Pad Conditioning Brush, you can clean, degrease and extend the life of every pad you use to polish your boat or RV. We can all agree that compounding and polishing a boat isn�t as enjoyable as say, hand-applying your favorite carnauba wax to your 1967 Corvette Stingray. That is why we�ve developed two products that make buffing out a boat easier than ever � Marine 31 Spray Polishing Pad Cleaner and Marine 31 Spray Polishing Pad Conditioner! By creating more lubrication for your compound or polish, the chance of it caking up or dusting during the buffing process is significantly reduced. The additional lubrication provided by Marine 31 Spray Polishing Pad Conditioner also reduces buffer hop, therefore improving consistency while decreasing user fatigue. Marine 31 Spray Polishing Pad Conditioner is arguably one of the most must-have products for compounding or polishing a boat. Use it once and you�ll wonder how you went without it! Marine 31 Spray Polishing Pad Cleaner removes all kinds of chemicals and contaminants that have been embedded into your buffing pad during the polishing process. This can include solvents, carrying agents, abrasives, petroleum distillates, silicones, chemical cleaners and worst of all, oxidized gel coat. Removing said contaminants and chemicals from your pads after each use ensures they perform like new when you use them in the future. Marine 31 Spray Polishing Pad Cleaner is a fast-acting cleaner that quickly and effortlessly removes caked-on compound, polish and wax residue from all buffing pad types. Wool, foam and microfiber pads will look and feel new after each cleaning. Marine 31 Spray Polishing Pad Cleaner features a low-foaming, easy-rinse formula that ensures no unwanted residue is left in the pad. Clean your pads with Marine 31 Spray Polishing Pad Cleaner so you can maximize your investment! Marine 31 Spray Polishing Pad Conditioner creates a smoother buffing experience by providing additional lubrication for your compound or polish. Marine 31 Spray Polishing Pad Conditioner is comprised of a unique blend of wetting agents that prevent compounds and polishes from caking up on the pad or from drying out while buffing. Marine 31 Spray Polishing Pad Conditioner is beneficial on foam, wool and microfiber pads. The Foam Pad Conditioning Brush removes excess, caked polish and restores the usable texture to your foam pads in seconds. An angled handle and textured grip give you excellent leverage as you press the brush against a spinning pad. Don�t stop working � clean the pad and keep polishing! A total retail value of $38.97. You save $9.98!